We get it. A yard ramp is a big purchase. You need to be fully informed so you can make the best decision for your facility. The best way to do that is to know your options. Our Yard Ramp Q&A provides answers to commonly asked questions about yard ramps. And, if you still need more information to decide which loading dock equipment is right for you, we’re always here to help. Do you manufacture steel yard ramps? Yes. Copperloy has been providing custom steel yard ramp solutions for more than 60 years. Our certified welders, experienced machinists and automated robotic cells combine for a custom steel fabrication division that can provide a yard ramp solution for nearly any industry or application. Does Copperloy offer used ramps? Yes. A used yard ramp provides a cost-effective solution when you know your know your material handling needs may change in the future. All Copperloy used ramps are factory certified and guaranteed. What yard ramp is best for vehicles traveling from grade level to dock height? 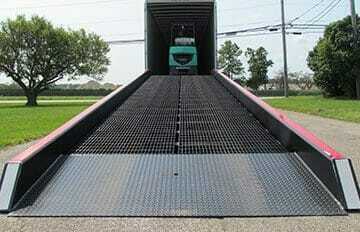 A dock-to-ground ramp allows trucks and other vehicles to travel easily from grade level to dock height. These ramps feature a high-traction surface and can easily be moved to another location. What types of ramps offer portability? If a permanent solution isn’t feasible at your facility, Copperloy’s mobile yard ramps can easily transform a vacant space into a loading station. Gain ground-level access to trucks, railcars or buildings with easy-to-move mobile ramps. Can I rent yard ramps? Yes. Copperloy has a variety of yard ramp rentals available for an affordable solution for short-term loading dock scenarios. Ensure employee safety and improve efficiency with a factory-certified yard ramp for rent. I have a unique loading dock situation. Can I request a custom solution? Yes. There’s no situation too unique that Copperloy’s engineering department can’t handle. We have provide custom fabrication solutions for more than 60 years. We work with pre-existing CAD drawings or create all new designs in 3-D modeling. Check out our blog for more creative material handling solutions.